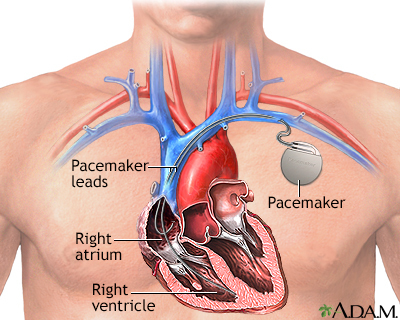 A pacemaker must be implanted under the skin. This procedure takes about 1 hour in most cases. You will be given a sedative to help you relax. You will be awake during the procedure. A small incision (cut) is made. Most often, the cut is on the left side of the chest below your collarbone. The pacemaker generator is then placed under the skin at this location. The generator may also be placed in the abdomen, but this is less common. A pacemaker senses if the heartbeat is above a certain rate. When it is above that rate, the pacemaker will stop sending signals to the heart. The pacemaker can also sense when the heartbeat slows down too much. It will automatically turn back on and start pacing the heart again. You will probably be able to go home after 1 day. You should be able to return to your normal activity level quickly. Olgin JE, Zipes DP. Specific arrhythmias. In: Mann DL, Zipes DP, Libby P, Bonow RO, Braunwald E, eds. Braunwald's Heart Disease: A Textbook of Cardiovascular Medicine. 10th ed. Philadelphia, PA: Elsevier Saunders; 2015:chap 37. Swerdlow CD, Wang PJ, Zipes DP. Pacemakers and implantable cardioverter-defibrillators. In: Mann DL, Zipes DP, Libby P, Bonow RO, Braunwald E, eds. Braunwald's Heart Disease: A Textbook of Cardiovascular Medicine. 10th ed. Philadelphia, PA: Elsevier Saunders; 2015:chap 36.